The BLOODHOUND Project aims to use a 1000 mph World Land Speed Record attempt to inspire the next generation to follow careers in science, technology, engineering and mathematics. In October 2017 the car, BLOODHOUND SSC, made its very first public test runs. These took place at Newquay Airport in Cornwall. 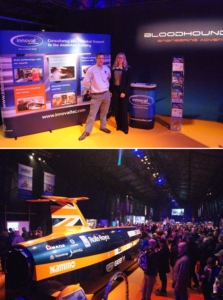 As a Product Sponsor of the BLOODHOUND project, Innoval was lucky enough to be there. The distance from Innoval to Newquay Airport is 231 miles. It took me over 4 hours to drive that distance. BLOODHOUND SSC, at its target speed of 1000mph, could do the same journey in under 15 minutes! Welcome to the mind bending world of BLOODHOUND. 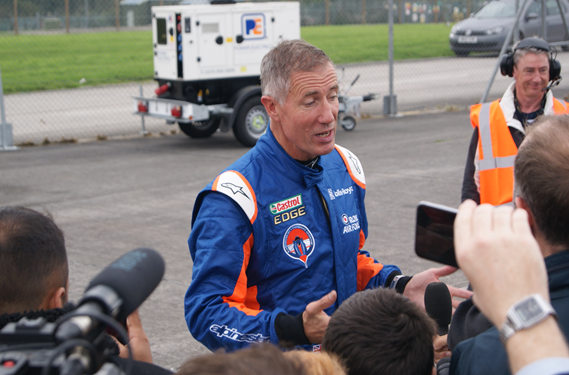 In its first publics runs, Wing Commander Andy Green, BLOODHOUND SSC’s driver, demonstrated the car’s awesome power by unleashing full re-heat on the EJ200 engine and taking the car up to 200mph. However, what is more staggering is that he had to back off the engine power at around 130mph to counter the over-swing of the jet engine (a jet engine continues to produce trust for a short time after throttle back). Furthermore, he had to apply the brakes at 150mph. This was to ensure that the carbon-carbon brakes (which do not work well when cold) had heated up enough to slow the car by the time it reached 200mph. All of this took place in 8 seconds. That’s 0 to 200 mph in 8 seconds! To put that into perspective, the world’s fastest production car, the Bugatti Chiron, can do 0-200 mph in around 16 seconds. 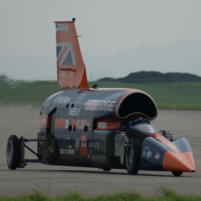 Innoval is one of the sponsors of BLOODHOUND’s land speed record attempt. As a result, the BLOODHOUND team invited us to exhibit at Newquay Airport for the duration of the testing. Helen Forrest and Timothy Clemson spent most of the week next to the life-size model of BLOODHOUND SSC talking to thousands of curious visitors about the car’s wheels. You can read more about our involvement with the project in a previous blog post; the fastest wheels on earth. For the runway tests, BLOODHOUND SSC borrowed its tyres from an English Electric Lightening Jet. These are the same tyres Thrust SSC used to make its UK test runs back in the 1990’s. The Lightening tyres are rated up to 200mph. Therefore, for the upcoming desert trials and the ultimate aim of 1000 mph, the car will need something significantly stronger. The wheels will not only have to carry the weight of a 7.5-tonne car, but they must not fall apart when spinning at over 10,000rpm with a force of 50,000g at the wheel rim! Due to the extreme nature of the desert running, the engineers will change the wheels between runs to inspect them. In total, the team have manufactured 13 wheels for the desert runs. These comprise the main set, a second set and one spare wheel. 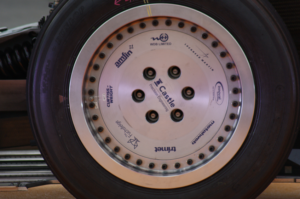 The final four wheels are uncut so that they can alter the design after the first test runs if necessary. You can read more about the desert wheels here. The next step towards breaking the land speed record will take place in 2018. Here the target is for Bloodhound to achieve 500 mph. In interviews I’ve seen with Wing Commander Andy Green, he seems confident that BLOODHOUND SSC can easily achieve 500 mph (if not slightly faster). In a situation which mirrors the Newquay test runs, the car itself won’t be hindered by the extra weight of the NAMMO rocket and the fuel system needed to power it. It will be running a few tonnes leaner than when the team goes for the 1000 mph target. Then the car will definitely need the rocket! However, the data gathered in the run up to the 1000 mph attempt will provide important information towards development of the rocket systems. 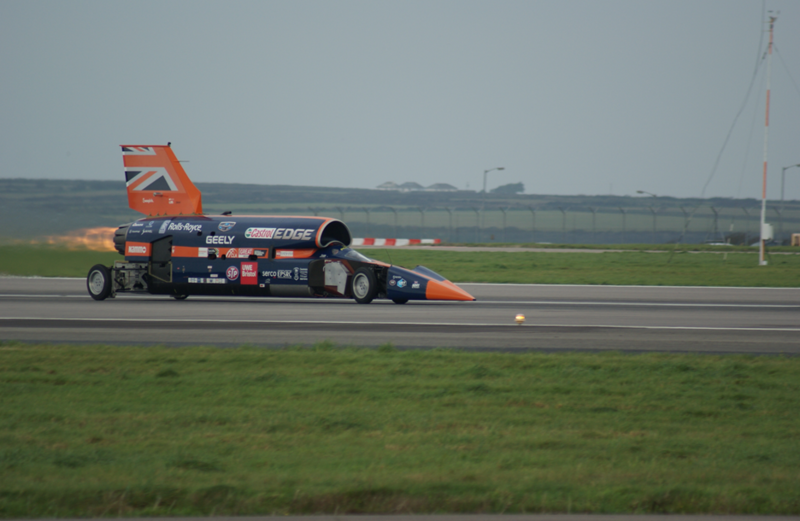 If you’d like to watch BLOODHOUND SSC’s test runs at Newquay Airport, have a look at this link. You might also like to read Andy Green’s BLOODHOUND Diary on BBC News.